This is a in Person class on how to read the Akashic Records, using Linda Howe’s Pathway Prayer Process©, for yourself and others. 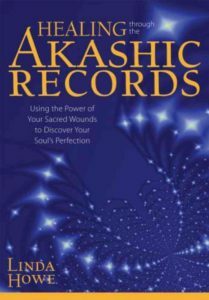 You will learn what the Akashic Records are and gain an understanding of how beneficial they are for expanding your inner self. You will have substantial time in class opening your Akashic Records as well as the Records of other people. You will also learn to open the records of your pets, your home and your business. This is a 12-hour class course, at the end of the course you will receive a Certificate that is recognized by Dr. Linda Howe. The only Prerequisite is to read “How to Read the Akashic Records” by Linda Howe. Books can be purchased either through Amazon or Heart and Soul Healing. There are no refunds, however, we offer a credit towards a future class. If you have any questions or to register just go to the contact page and send me a message. 1) Energy Healing. Learn how energy healing works in the Akasha for yourself and others. 2) Clearing Ancestral Patterns. Learn how to heal ancestral patterns and embrace the ones that support you. 3) Past Lives. Learn how past lives can support you so you can make peace with then and activate ancient wisdom. 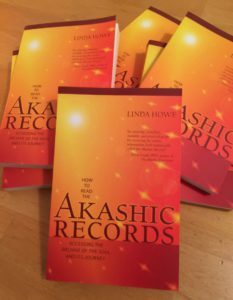 The prerequisite to this class is to read Linda Howe’s book, “How to Read The Akashic Records”. This is a 12-hour class time course, and at the end you will receive a Certificate that is recognized by Dr. Linda Howe. There are no refunds, however, we offer a credit toward a future class. If you have any questions or want to register just go to the contact page and send me a message. If you would like to have either of these courses in your town, send me a message and we can arrange one. This is a 12-hour course. Taking this course will enable you to explore your Sacred Wounds as a point of power and peace in yourself. Within this course, you will learn what ‘healing through the Akashic Records’ is all about. We will look at our Sacred wounds as a point of power within yourself. Activating and empowering Self Love. We will then look at Sacred Wounds as a path of Peace with others. Working with Resentments and Freedom from limiting patterns. After clearing space within our Akashic Records, we will activate your Ascension Matrix. Empowering Gratitude, Grace and Generosity. This course will empower your personal life as well as your spiritual practice. 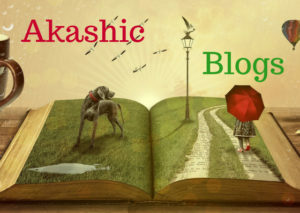 There is no prior experience with the Akashic Records needed, nor do you need to be psychic. However, I strongly recommend you read “Healing Through the Akashic Records” by Dr. Linda Howe. At the end of the course, you will receive a certificate through the Dr. Linda Howe Center for Akashic Studies. If you have any questions or want to register go to the contact page and send me a message. Hello Michelle, I sent you a email. All these courses are in person. If you are interested in a class in your area let me know and I will work with you to bring one to you. I am very interested in your courses. I am near Edmonton Alberta. Do you have any courses planned for there in the near future? Good Morning Kevin, I heard rumours that you may be doing a beginners class in Bonnyville in Jan 2019. Is this true?? The rumours are true, I am just confirming dates and will post them in the near future. I appreciate your interest. Are you thinking of coming to southern Alberta in the new year to teach a beginning class. I am an hour south west in the lovely foothills of Alberta, and know a beautiful space to teach in? I do not have nothing planned as of yet, but I would love to come teach in the foothills of Alberta.